A sampling of additional key design considerations for the measure. Table 3.1 presents a simplified summary of the potential applicability of each individual traffic calming measure and the likelihood of its acceptability for a particular setting. The screening is presented in terms of the location (intersection or roadway segment), the roadway functional classification, and other attributes of the roadway function (emergency services access requirements, presence of a transit route). 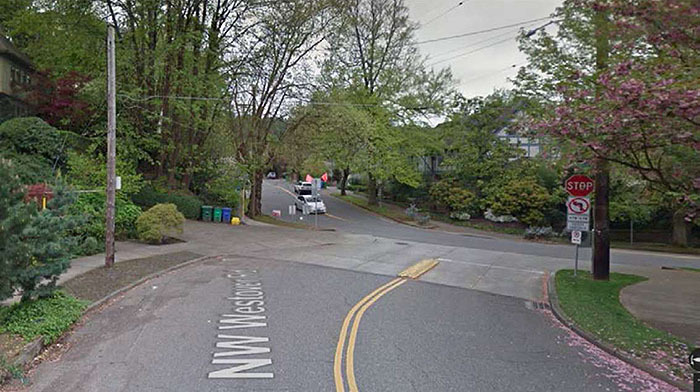 It is critical to remember that the applicability of a particular traffic calming measure has as much to do with the problem to be addressed as the physical setting elements listed in the table. A more comprehensive assessment of measure applicability is presented in a distinct table for each individual measure. Table 3.1 can be used as an initial screening tool to identify whether a particular traffic calming measure has a likely fatal flaw in terms of its overall applicability and acceptability. For example, the table illustrates that neither a speed hump nor traffic circle is an appropriate measure along a thoroughfare or major street. Note: Refer to individual traffic calming measure section for a complete description of the appropriate application of each measure. The Pedestrian and Bicycle Information Center provides a link to a document that also provides cost estimates for a variety of measures that encompass pedestrian and bicycle infrastructure improvements, including some traffic calming measures (www.pedbikeinfo.org/planning/facilities.cfm). 3 Source: ITE Journal article "New Traffic Calming Device of Choice"
A short-term initiative is needed to provide traffic calming on a local street during a major traffic generating event or nearby construction on the highway system. 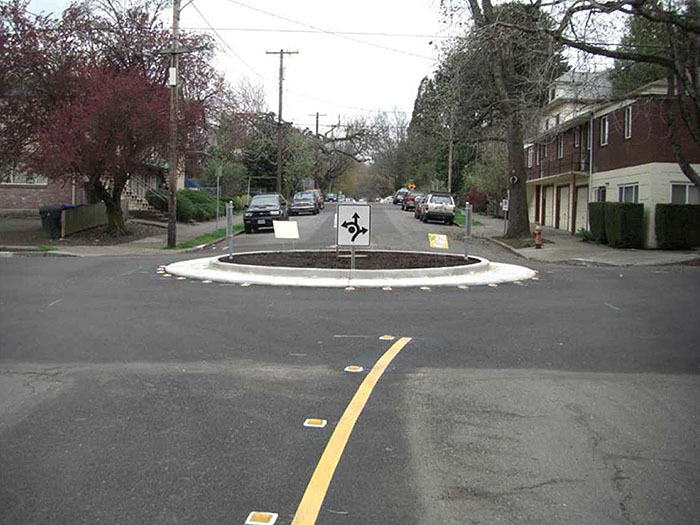 Typical materials used in a temporary traffic calming feature include delineators, precast concrete curbing, removable rubber speed humps, precast or wood planters, rolled asphalt, pavement markings and signage. 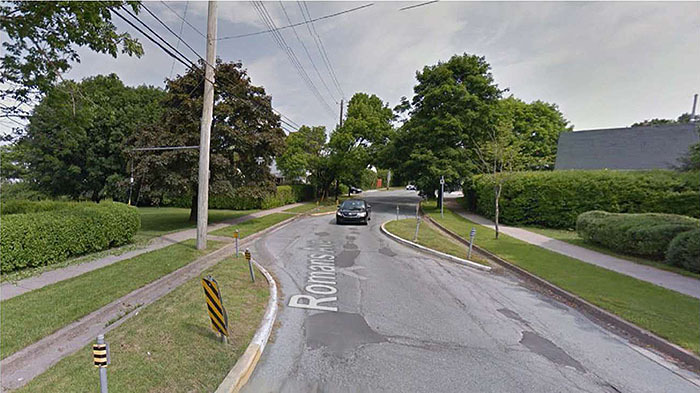 The potential effectiveness of a traffic calming measure can likely be affected by the quality of its design and implementation. Therefore, the limitations introduced in a temporary installation may likewise limit the effectiveness of the measure. A lateral shift is a realignment of an otherwise straight street that causes travel lanes to shift in one direction. The primary purpose of a lateral shift is to reduce motor vehicle speed along the street. A typical lateral shift separates opposing traffic through the shift with the aid of a median island. Without the island, a motorist could cross the centerline in order to drive the straightest path possible, thereby reducing the speed reduction effectiveness of the lateral shift. In addition, a median island reduces the likelihood a motorist will veer into the path of opposing traffic, further improving the safety of the roadway for motorists. The schematic in Figure 3.4.1 illustrates the lateral shift concept. Figure 3.4.2 shows a lateral shift in conjunction with on-street parking. 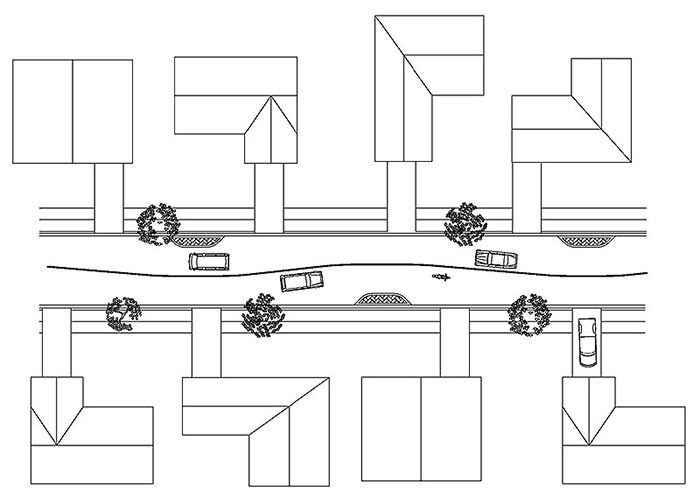 A typical lateral shift separates opposing traffic with a median island (as illustrated in the sample design in Figure 3.4.5). Without a median island, a motorist can cross the centerline to negate the designed horizontal deflection and maintain a higher travel speed. The expected level of speed reduction is a function of the amount of the lateral shift and the angle of deflection. A lateral shift of at least one-lane width and an angle of deflection of at least 45 degrees is a common target. A lateral shift can be created by means of either a curb extension or an edge island. A curb extension offers a better opportunity for aesthetic enhancement through landscaping. But an edge island can leave an existing drainage channel open and tends to be less costly to construct. 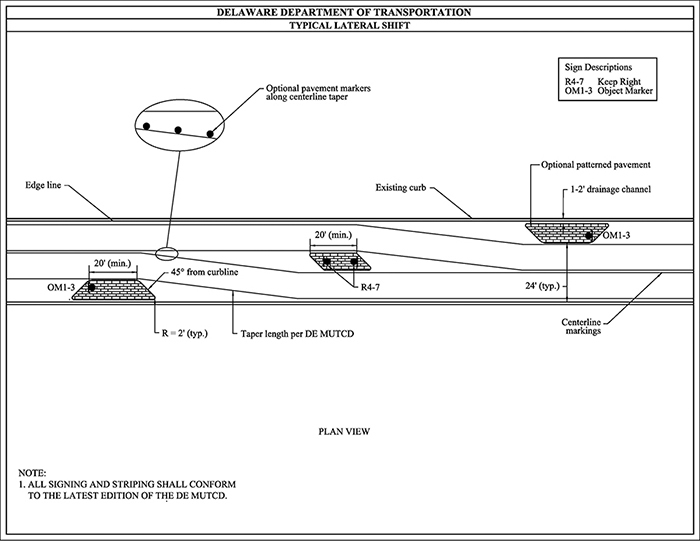 Edge line tapers should conform to the MUTCD. The curb extension or edge island should have 45 degree tapers to reinforce the edge lines. A curb extension or edge island that forms the lateral shift should have a vertical element (e.g., signs, landscaping), a reflector or some measure to draw attention to it. Either a barrier or mountable curb can be used on an island that forms a lateral shift. 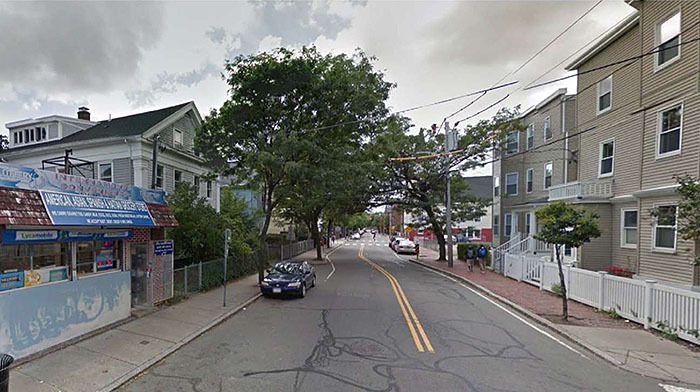 The use of a mountable curb is more forgiving to motorists and is acceptable because the island is not expected to serve as a pedestrian refuge. For a low speed street, the mountable curb may be placed at the edge of the travel lane rather than offset by 1 foot or more as is required for a barrier curb. A midblock location near a streetlight is preferred. A chicane is a series of alternating curves or lane shifts that are located in a position to force a motorist to steer back and forth out of a straight travel path. The curvilinear path is intended to reduce the speed at which a motorist is comfortable travelling through the feature. The lower speed could in turn result in a traffic volume reduction. The chicane curves can be created with a curb extension that alternates from one side of the street to the other. A chicane-like effect can also be achieved by alternating on-street parking from one side of the street to the other. Parking can create the chicane effect as long there is sufficient demand so that a majority of the on-street spaces are occupied during the times when vehicle speed is perceived to be a safety issue for pedestrians. Parallel parking, angled parking, or a combination may be used. Or it can also include landscaped curb extensions to beautify the street, screen the parked vehicles, and create protected parking bays. The schematic in Figure 3.5.1 illustrates the chicane concept. Figure 3.5.2 shows an example of a chicane. 7 As a transit vehicle travels through a chicane, the vehicle motion can decrease passenger comfort or contribute to slips or falls for standing transit passengers. Loose personal articles can also be dislodged within a transit vehicle. The typical chicane separates opposing traffic by means of double solid yellow lines with recessed pavement markers. Even this may not be enough to discourage some motorists from cutting across the centerline to minimize deflection. To discourage this behavior, a raised median may be installed. The median may be narrow and mountable without landscaping. 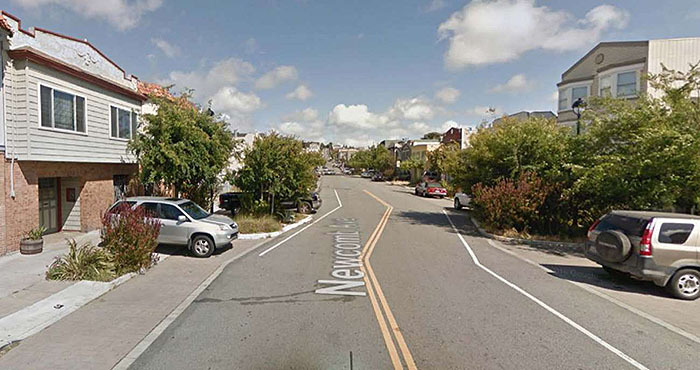 An alternative, if right-of-way permits, is to provide a wider and landscaped median. 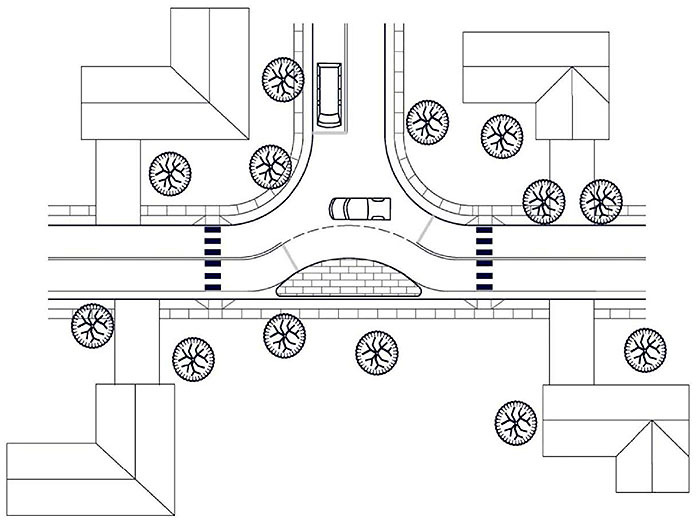 A chicane can be created by means of either curb extensions or edge islands (an example application is shown in Figure 3.5.5). An edge island can leave an existing drainage channel open and tends to be less costly to construct than a curb extension. The typical chicane uses trapezoidal islands because experience has demonstrated the shape is more effective in reducing speeds than a semi-circular shape. A curb extension or edge island that forms a chicane should have vertical elements (e.g., signs, landscaping) to draw attention to it. The edge line taper should conform to the MUTCD taper formula. A curb extension or edge island with a 45 degree taper tends to reinforce the edge lines. A mountable curb should be used on a curb extension or edge island that forms a chicane. A mountable curb is more forgiving than a barrier curb for a motorist that traverses the chicane and the edge island or curb extension that form the chicane is not an appropriate location for a pedestrian crossing (and therefore should not serve as a pedestrian refuge). For a low-speed roadway, a mountable curb may be placed at the edge of the travel lane rather than offset by 1 foot or more as with barrier curbs. A sample chicane design is illustrated in Figure 3.5.6. 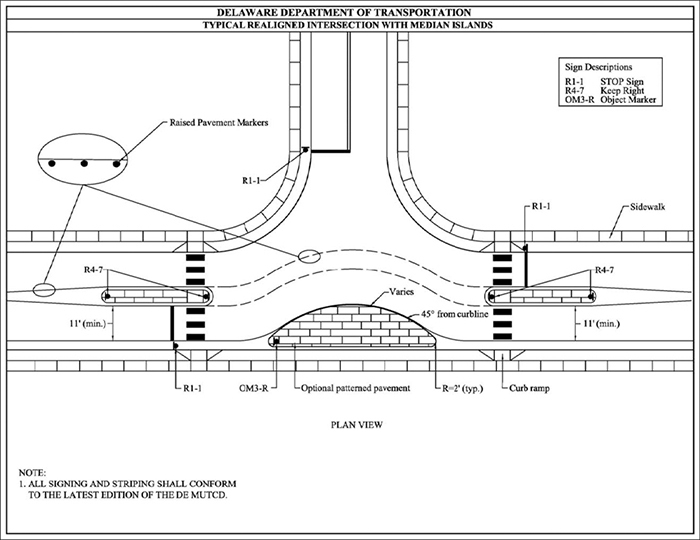 For the purpose of traffic calming, a realigned intersection is the reconfiguration of an intersection with perpendicular angles to have skewed approaches or travel paths through the intersection (as illustrated in the Figure 3.6.1 schematic). 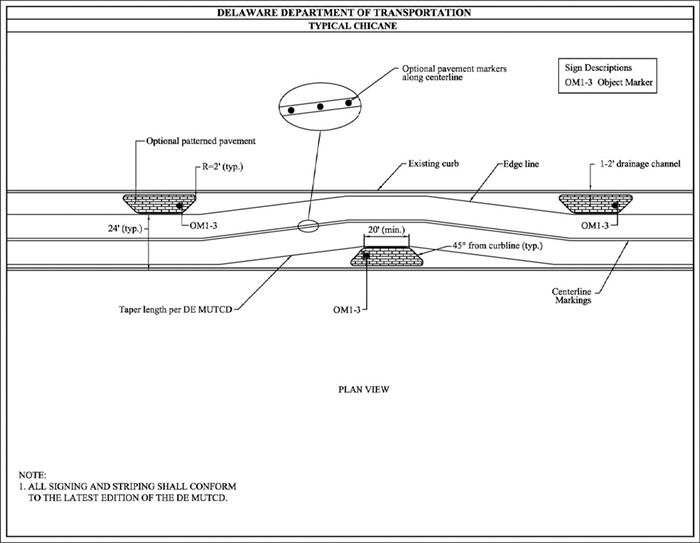 The expectation is that these physical features will remove or discourage fast vehicle movements through the intersection. 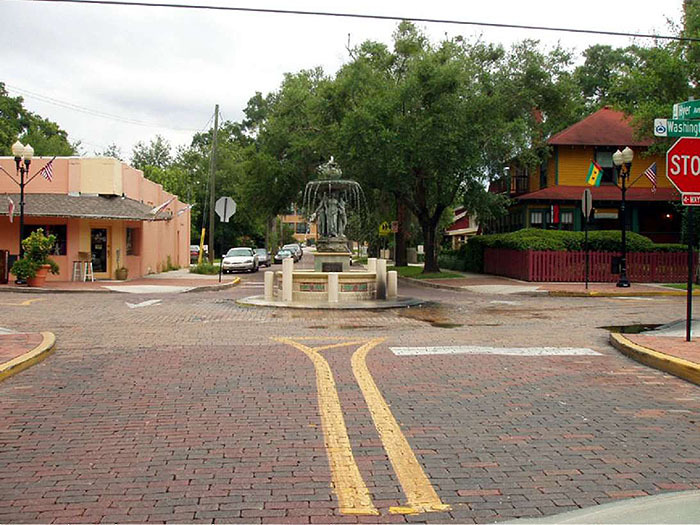 The most common application is the conversion of a T-intersection with straight approaches into curving streets meeting at right angles. The result is the removal of all straight paths through the intersection. Prior to design of a realigned intersection, a traffic review and capacity analysis should be completed for the intersection. The analyses should determine the appropriate traffic controls for the intersection and determine the extent of queuing and delay (vehicle and pedestrian) changes. 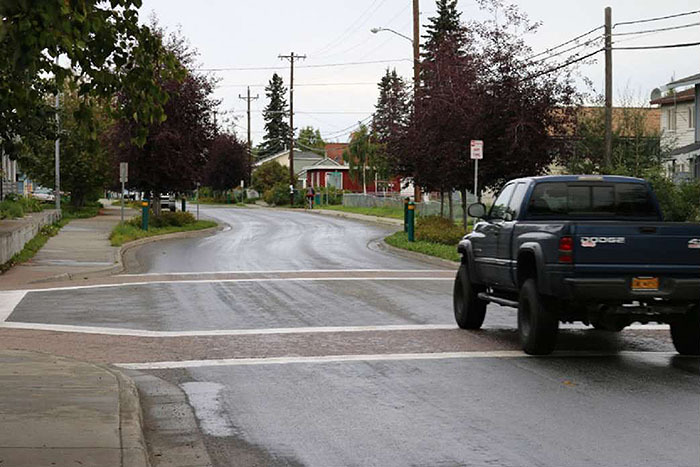 As with any intersection, a typical realigned intersection design needs to consider lighting, drainage, pedestrian safety, pedestrian mobility, and bicyclist access. 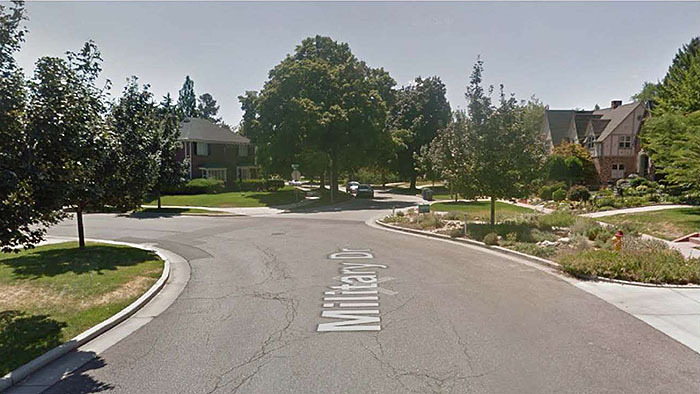 The curb extension or narrowing at the intersection should include signs or landscaping that draw attention to it. However, adequate intersection sight distance should be maintained. Figures 3.6.5 and 3.6.6 illustrate sample designs for realigned intersections with and without approach leg medians, respectively. A traffic circle is a raised island, placed within an unsignalized intersection, around which traffic circulates. A circle forces a motorist to use reduced speed when entering and passing through an intersection, whether the vehicle path is straight through or involves a turn onto an intersecting street. A traffic circle can have Stop signs or Yield signs on the intersection approaches. The primary benefit of a traffic circle is an expected reduction in the number of angle and turning collisions. An additional benefit is that it can slow high-speed traffic at the intersection. 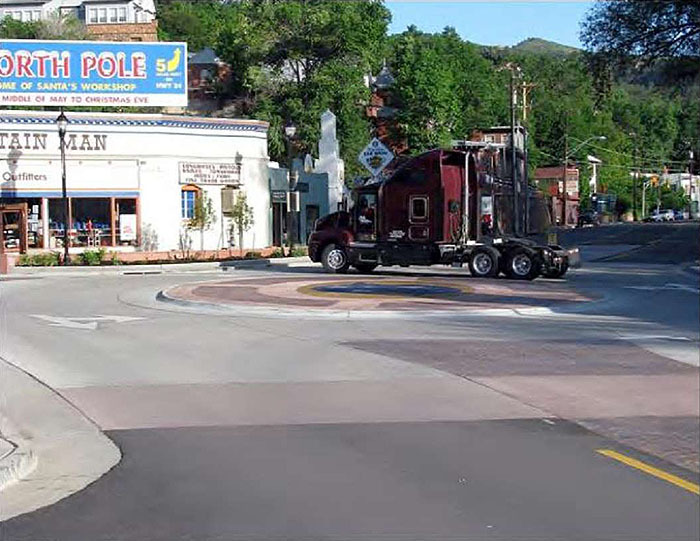 A typical traffic circle has a horizontal clearance that is too small for a left-turning truck, emergency vehicle, or bus to circulate counterclockwise even with a partially mountable center island. If the local jurisdiction permits the movement, the large vehicle can make a left turn in front of the island. However, some jurisdictions prohibit turning in front of the island. A traffic circle is typically designed to fit within the travel lanes of an existing intersection. Because of the infrequent large vehicle turning left on the near side of the circle, the intersection approaches do not have splitter islands (see Figures 3.8.1, 3.8.2, 3.9.1, and 3.9.2 for photographs of splitter islands). 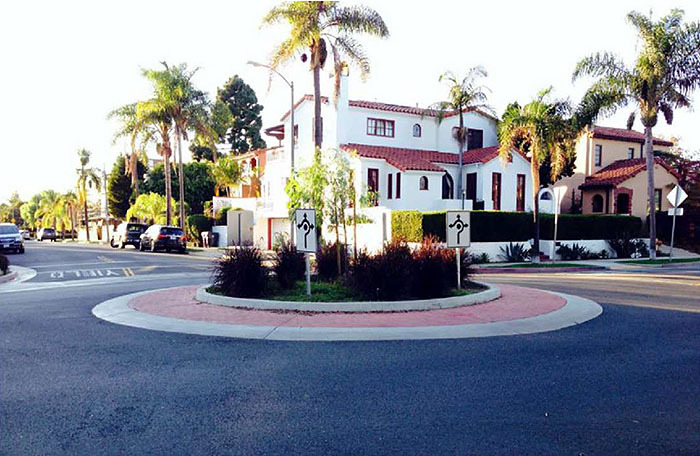 A traffic circle can simply be a painted area, but it is most effective when it is defined by a raised curb and landscaped to further reduce the open feel of a street. 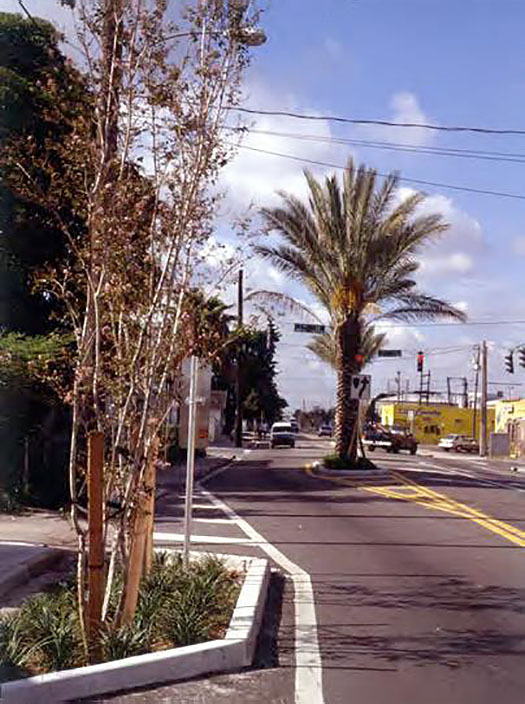 A traffic circle can be landscaped with ground cover, flowers, and street trees. Figures 3.7.1 and 3.7.2 illustrate two extremes in the amount of traffic circle landscaping. A traffic circle is usually circular in shape, but may be oval to fit a particular intersection. The center island of a traffic circle is not traversable. 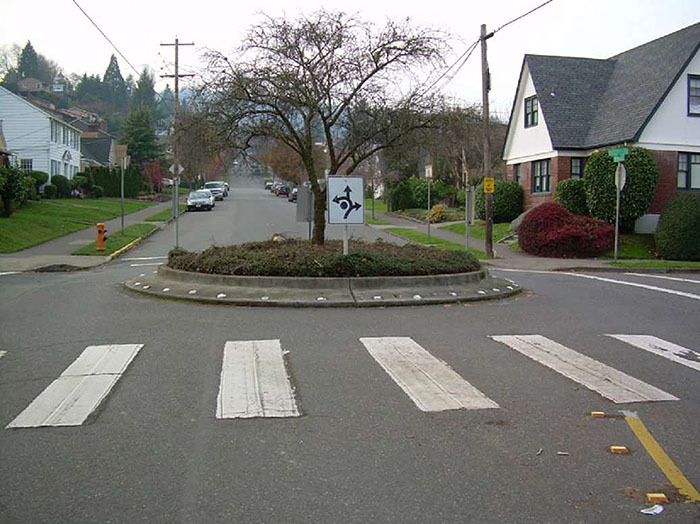 The center island in the traffic circle should be large enough so that all vehicles are required to follow an indirect path, even to proceed straight through the intersection. The roadway design vehicle for a traffic circle is usually a passenger car. A larger vehicle may need to cross in front of the traffic circle in order to make a left turn. A narrow truck apron used at a traffic circle should be designed, at a minimum, to provide through movements for a service vehicle (SU-30). The center island of a traffic circle should be a different pavement type than the surrounding roadways to increase its visibility. Textured or concrete pavement is commonly used to distinguish the center island from the surrounding pavement. 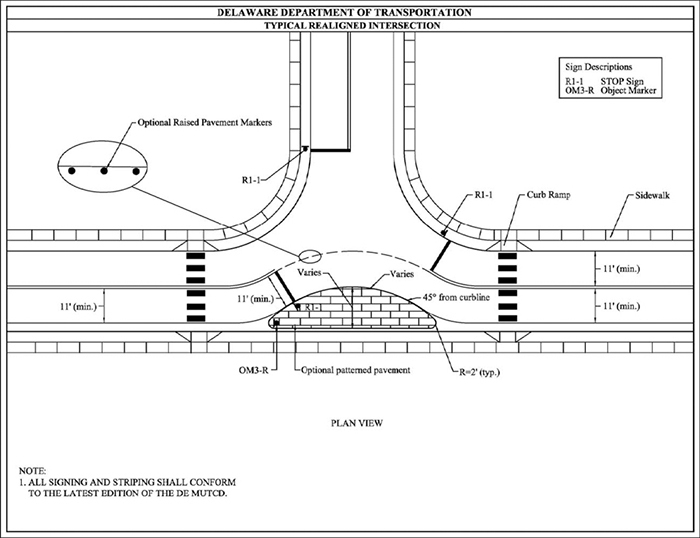 For a traffic circle, the center island pavement is typically 3 inches above the existing street grade. Traffic circles typically maintain all existing street grades and drainage is not often an issue. 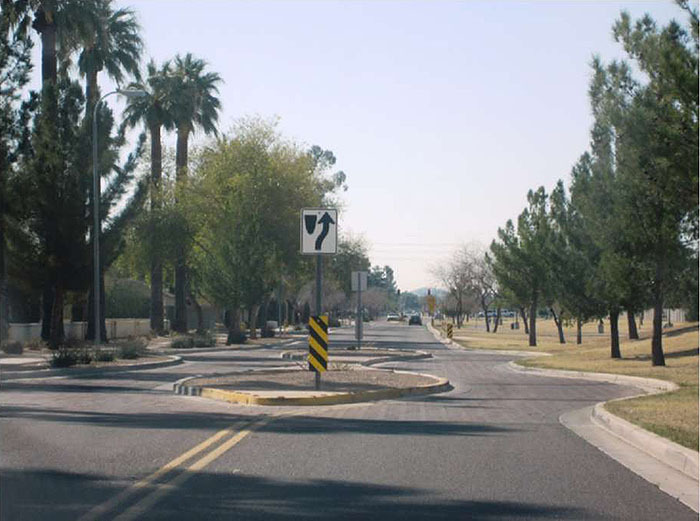 If a traffic circle is designed for a T-intersection, the intersection curb should be either extended at the entrance and exit to the intersection or indented within the intersection to ensure adequate deflection of the vehicle path along the top of the T.
Typical complementary signage is a Yield sign on each approach. It is common for Stop sign control to remain in place at a traffic circle, in particular where Stop signs predate installation of a traffic circle. A small modern roundabout and mini-roundabout is a raised island, placed within an unsignalized intersection, around which traffic circulates. 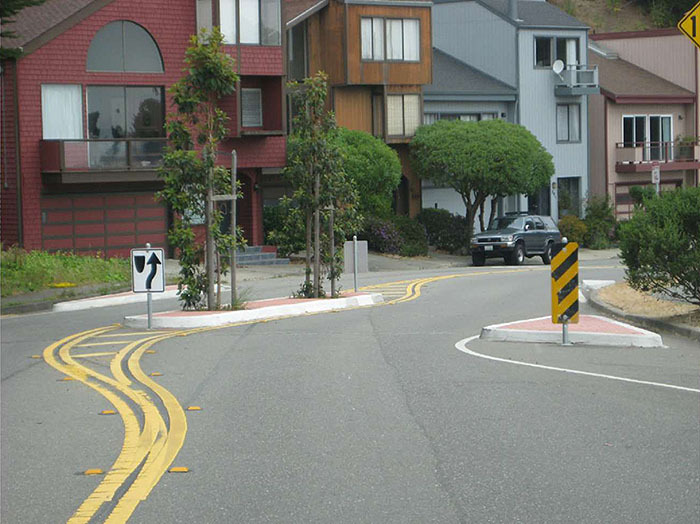 The center island forces a motorist to use reduced speed when entering and passing through an intersection, whether the vehicle path is straight through or involves a turn onto an intersecting street. It is also expected to reduce the number of angle and turning collisions. Both a small modern roundabout and a mini-roundabout are designed in accordance with roundabout design principles. Both are designed so that all traffic can circulate counterclockwise around or partially over the center island. The principal difference between a small modern roundabout and a mini-roundabout is found at the center island. For a small modern roundabout, the center island is not traversable and can be landscaped with ground cover, flowers, and street trees. In contrast, the center island of a mini-roundabout is fully traversable. Both a small modern roundabout and mini-roundabout use splitter islands to direct traffic entering the intersection. In order to accommodate trucks, fire trucks, school buses and vehicles towing trailers, the splitter islands can be either mountable or at-grade. Traffic entering the intersection yields to vehicles within the roundabout. 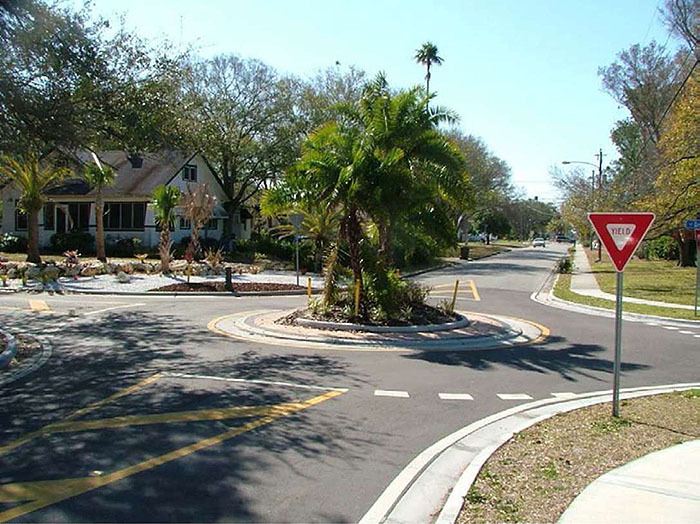 The reader should reference the Federal Highway Administration (FHWA) report Mini-Roundabouts for a complete description of mini-roundabout characteristics, applicability, and effectiveness. 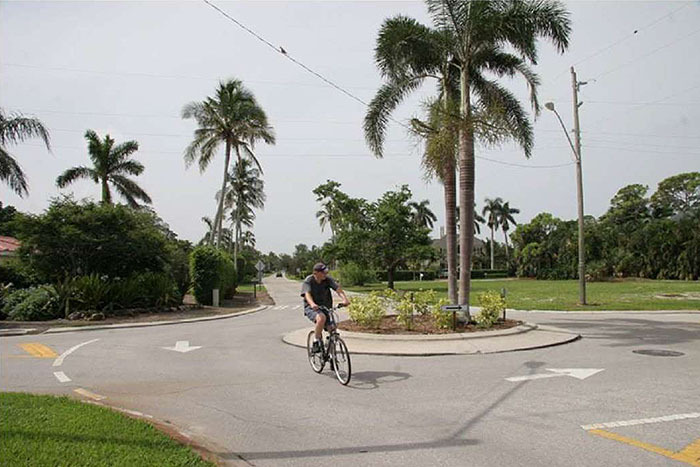 As defined in the FHWA report, "a mini-roundabout is a type of intersection that can be used at physically-constrained locations in place of stop-controlled or signalized intersections to help improve safety problems and reduce excessive delays at minor approaches .... Mini-roundabouts generally have an inscribed circle that is small enough to stay within the existing right-of-way (or within the existing curb lines if adequate space is available). Mini-roundabouts operate in the same manner as larger roundabouts, with yield control on all entries and counterclockwise circulation around a mountable (traversable) [center] island." 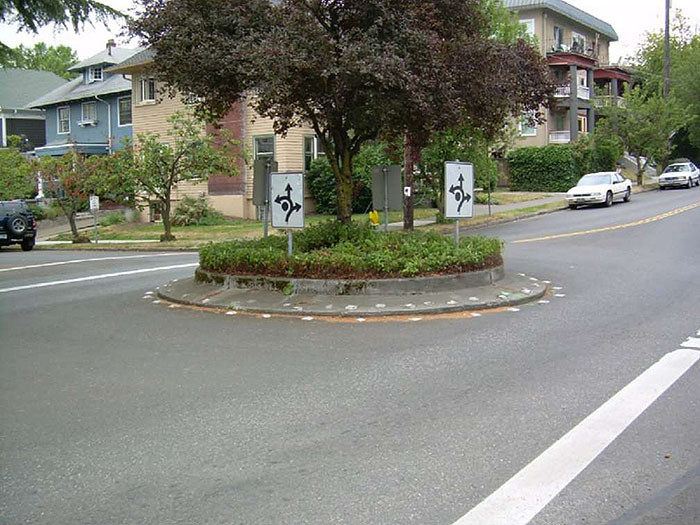 A photograph of an example small modern roundabout is shown in Figure 3.8.1. 9 A traffic calming feature placed midblock and in the middle of a road is considered a median island and is considered a separate measure. 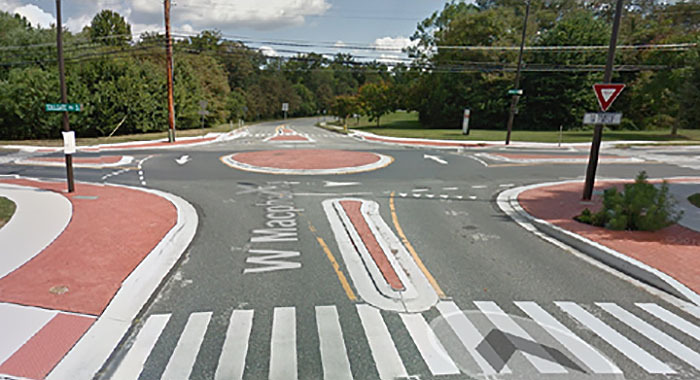 The center island of a small modern roundabout is not traversable. The center island of a mini-roundabout is fully traversable. The design vehicle for travel around a small modern roundabout or mini-roundabout is the passenger car. A single-unit truck can pass around either but may need to mount the apron of the center island. A larger truck or bus passing through a small modern roundabout may also need to traverse the center island apron. 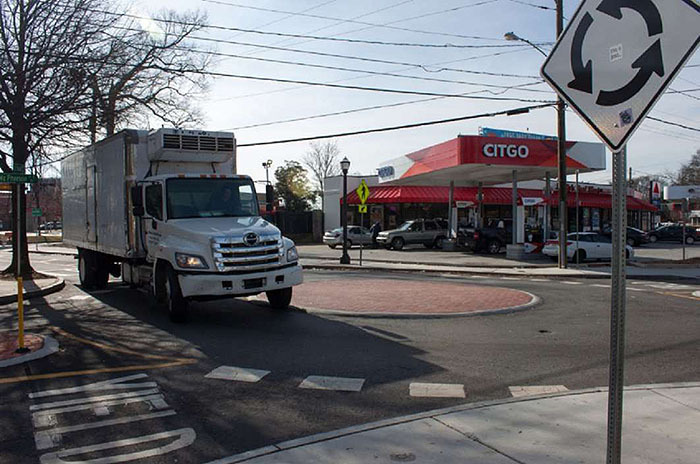 When a larger truck or bus passes straight through a mini-roundabout intersection, it may have to traverse a portion of the center island. When making a left turn at a mini-roundabout, a larger truck or bus is not able to circulate counterclockwise around the center island, but instead travel over the center island at a slow speed (see Figure 3.8.4). The center island of a mini-roundabout should be a different pavement type than the surrounding roadways to increase its visibility. Textured or concrete pavement is commonly used to distinguish the center island from the surrounding pavement. For drainage, the circulating lane of a small modern roundabout and mini-roundabout typically slopes away from the center island at a slope between 1 and 2 percent. If a small modern roundabout or mini-roundabout is designed for a T-intersection, the intersection curb should be either extended at the entrance and exit to the intersection or indented within the intersection to ensure adequate deflection of the vehicle path along the top of the T.
Typical complementary signage is a Yield sign on each approach. 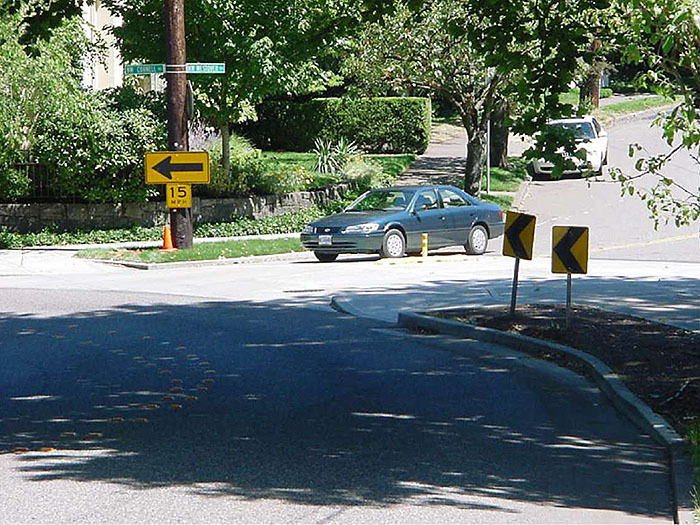 The MUTCD has a sample striping layout for a mini-roundabout. 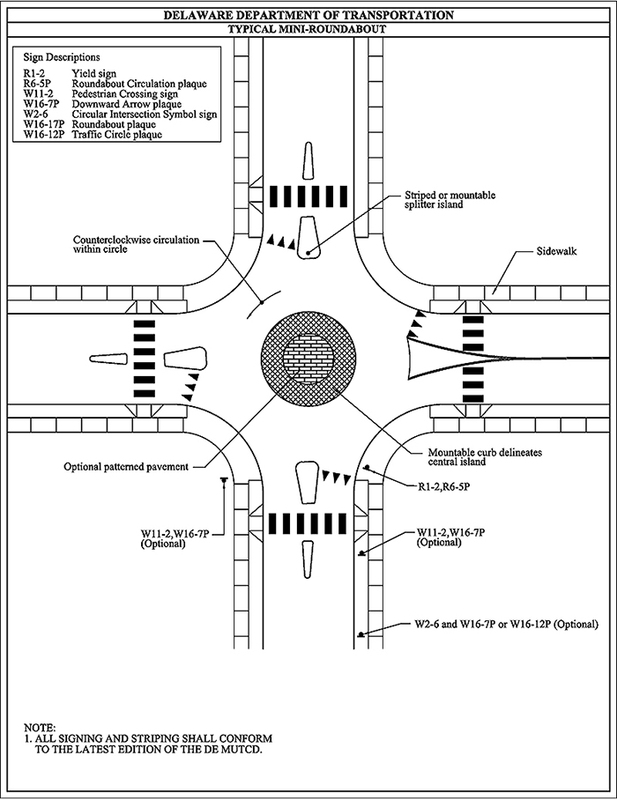 A sample design for a mini-roundabout is presented in Figure 3.8.5. Note: In order for this design to be ADA-compliant, the splitter island on the right-hand leg of this mini-roundabout must be striped and flush with the pavement.